All it takes is one rock and then it's lights out on your adventure. Whether it's from a semi-truck on a chip-seal road, or following a KTM too close in the dirt, there's always risk of damage to your headlight. 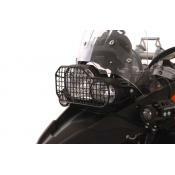 Protect your expensive and vulnerable headlight with this quick release clear guard from Touratech. 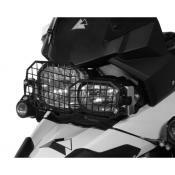 Touratech clear plastic headlight guards are made of high-strength Macrolon material and are specifically designed to maximize protection for for your expensive glass headlight lense and housing. The quick release design of this headlight guard makes it fast and easy to clean the bugs and dust from your headlight guard and headlight lense when you stop for a fuel break. Simply just pull the guard away from the bike and it will click out of its mount. To reinstall, simply snap the guard back into its quick-release sockets; easy to do, even while wearing gloves. 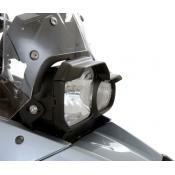 It's easy to install and styled to match the aggressive lines of the BMW F800GS, F700GS, and F650GS (twin). Get one before you have to buy a headlight assembly too! To reduce headlight glare at night from the guard, it is highly recommended to purchase the available Anti-Glare Shield.